Hepburn Springs is a little Victorian spa town with a big reputation for luxury experiences and pampering. It’s the place you fantasise about escaping to for the weekend or for a few days to unwind, be surrounded by nature and get in touch with your own natural rhythms. It’s also a dream hideaway location for couples. An important part of any getaway is finding the right accommodation. Booking into luxury accommodation in Hepburn Springs is all part of the getaway experience, allowing yourself to enjoy a little bit of indulgence and some well-earned pampering. Saffron and Horizon, two architect designed villas, provide guests with luxury accommodation in the heart of Hepburn Springs. When you dive into a getaway at Hepburn Spa Pavilions sink into your experience with luxurious amenities and special treats that provide you with everything to make your holiday one you’ve dreamed of. Creating a relaxing ambience and sense of luxury begins at Hepburn Spa Pavilions with the design of the two villas, Saffron and Horizon. Great design cannot be faked and on entering the villas, there is no doubt that you are stepping into luxury accommodation, where everything has been carefully chosen for its design aesthetic. The villas were built using high quality materials, including natural and polished timbers and stone. Colours echo the natural beauty of the landscape, as do the many beautiful curves in the design. The mark of luxury accommodation is how guests are made to feel in their accommodation. Luxury accommodation pampers guests with surprise treats and supplies. On arrival at Hepburn Spa Pavilions guests will find a selection of high quality goodies in the pantry and the fridge, including the best freshly ground coffee and Italian biscotti. Each double storey villa is designed with two double bedrooms downstairs. 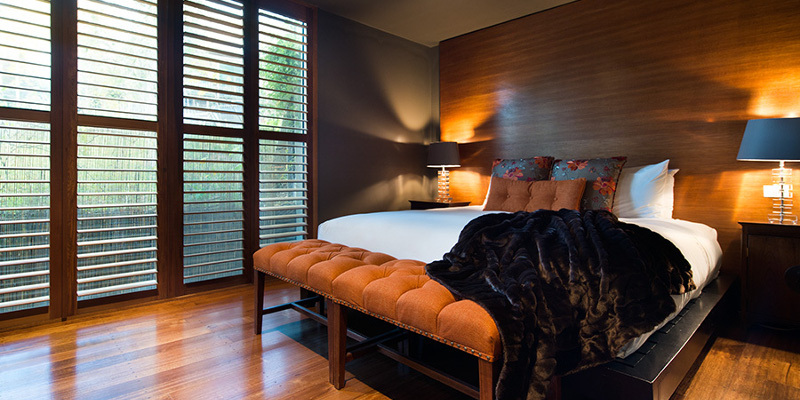 Timber shutters on the windows in the king sized bedrooms can be closed to enhance the sultry, romantic appeal. 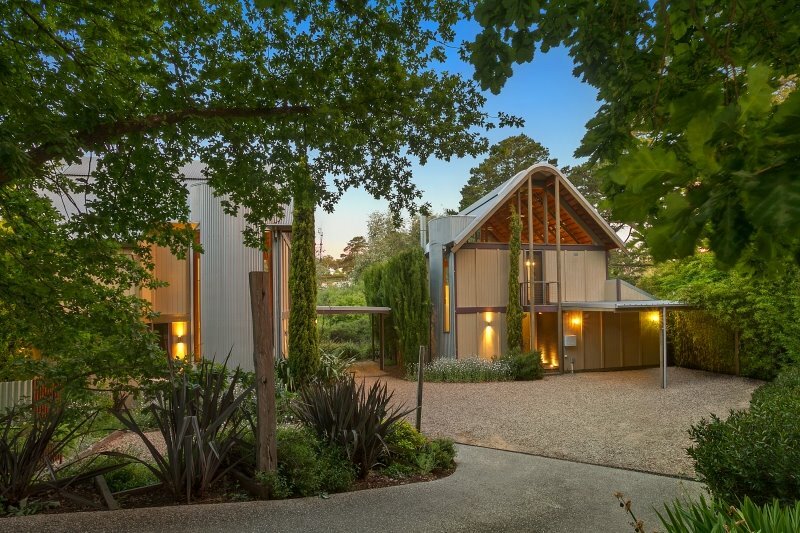 When opened, floor to ceiling windows reveal a private natural bush landscape. Crisp, high quality sheets and bed linen are undoubtedly one of the hallmarks of luxury accommodation. At Hepburn Spa Pavilions each king size bed is dressed with exotic silks and has a pillow topped mattress for maximum comfort and a warm goose down quilt for a perfect night’s sleep. 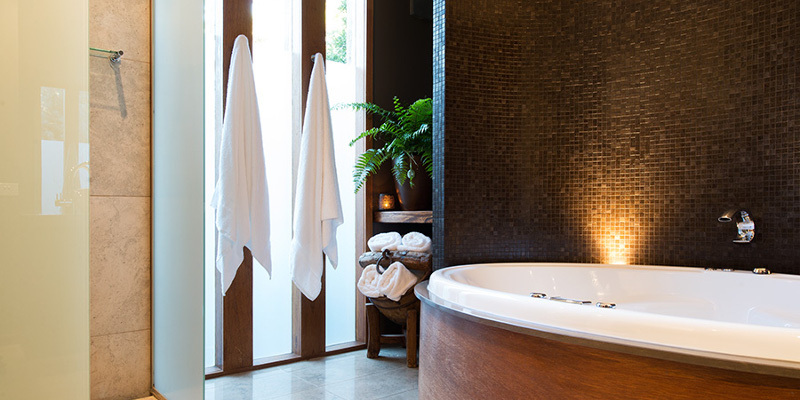 First class luxury accommodation in Hepburn Springs provides private spa and bathing facilities for guests to enjoy in complete privacy, minus the costs associated with booking into a day spa. Located off each bedroom is a private designer spa room and bathroom fitted with a huge luxury hydrospa and walk in shower. Bathe for as long as you desire in your own luxury spa retreat. Every comfort is catered for at Hepburn Spa Pavilions with deep plush velvet sofas and comfy cushions in the lounge room – perfect for many hours of relaxing, gazing at the view. Lie back and enjoy snoozing in front of the fire in cooler weather. When you stay in luxury accommodation comfort should be available at the click of a switch. Saffron and Horizon each has a central gas log fire in the lounge room, as well as split systems in each room. All audio visual technologies are provided to enjoy a range of entertainment throughout your villa. The romance of the downstairs bedrooms makes way for lofty views and open plan elegance in the living space above. Soaring timber ceilings are supported by thick oregon posts and huge windows overlook a natural bush setting. 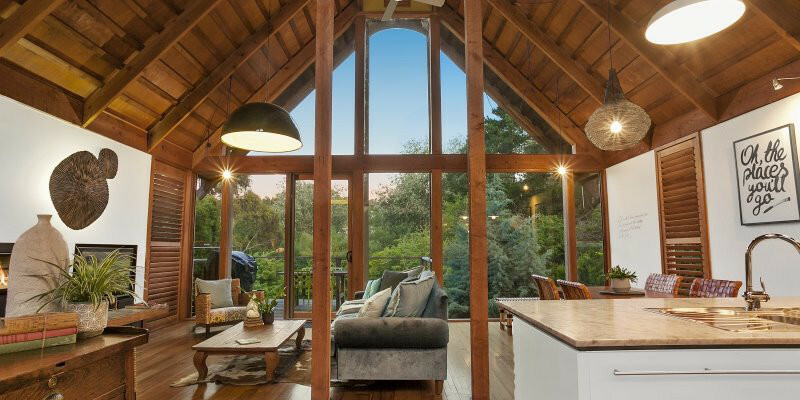 Wander outside onto an elevated deck, high above the trees, overlooking Hepburn Springs Reserve. It is the perfect place to enjoy alfresco breakfast or dinner during your stay. Luxury accommodation provides guests with a maximum of choice. The kitchen at Hepburn Spa Pavilions is fitted out with everything a family or couple needs to prepare a morning coffee and breakfast or an oven cooked meal. In keeping with the high quality, all crockery, pots, pans and appliances have been selected for their timeless elegance and practicality. Luxury accommodation in Hepburn Springs makes it easy for guests to find places to eat, shop and be pampered. Hepburn Spa Pavilions is centrally located on the edge of Hepburn Springs Reserve. The famous Hepburn Bathhouse is a five minute walk across a bridge in the gardens below your villa. A number of popular day spas are also only a short walk, as well as the best Hepburn Springs restaurants. Rubens is a popular Italian pizza house or for something really special enjoy a chef’s Hat experience at the Argus-Dining-Room. Hepburn General Store is also a short stroll away, providing all your basic supplies or a really good coffee or lunch.